"A better sleep tonight means a better tomorrow." World Sleep Day this year will occur on Friday, March 16th. 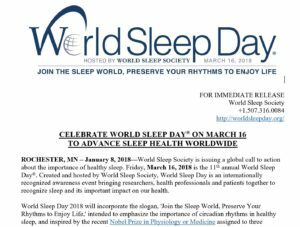 Read details about this event in the official press release provided by our colleagues at the World Sleep Society. Click the page below to access the PDF. Community Sleep Coach will once again be participating in raising sleep awareness during this important month. Copyright © 2019 Community Sleep Coach Inc.